Will Davis is an experienced communicator, widely read author and well-known researcher in the field of nuclear energy. He is the Communciations Director of the N/S Savannah Association, Inc. and serves the American Nuclear Society as a consultant in the field of communications and social media. He also researches and writes content related both to industry news and the history and impact of nuclear energy under contract to both the American Nuclear Society and Fuel Cycle Week. He serves on the Board of Directors for both the N/S Savannah Association, Inc. (for whom he is also the Historian) and PopAtomic Studios. His blog, Atomic Power Review, is among the most popular nuclear energy blogs in the world and has been online since April, 2010. Davis served in the United States Navy 1986-1993, during which time he qualified as Reactor Operator on two different submarine nuclear power plants; see full qualifications below. •Communications Director (named March, 2014) Responsible for both external and internal communications for this 501(c)3 corporation. Responsible for newsletter content, editing. Position delineated in bylaws; first person to hold this position for NSSA. •Historian (named March, 2014) Responsible to produce official histories of the ship itself, and of the organization, as set out in the bylaws. First person to hold this position for NSSA. •GET 1 level MARAD (US Maritime Administration) qualified for Contractor unrestricted access to N.S. Savannah, and qualified Docent for N.S. Savannah Association Inc. both May 17, 2014. American Nuclear Society: Member since June 2011. •Member, Communications Committee (formerly Public Information Committee) for period June 2013 - June 2016. Chairman, Social Media Subcommittee. Member, Communications Committee Steering Committee. •Consultant, May 2012 - present. Administrator and Moderator of ANS Social Media e-list. Davis' first contribution to the ANS magazine NUCLEAR NEWS was published in February 2014. Global America Business Institute: Consultant since May 2014. Click here to see bio at GABI consultants page. Wrote and delivered presentation "Positive Directions for the Korean Nuclear Industry - Past Challenges, Reformation, and Outlook" for GABI. Delivered at U.S.-Korea Nuclear Roundtable, May 16, 2014. Click here for GABI page on this event. Fuel Cycle Week: Contributing Author, September 2012 - present. 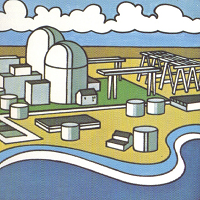 Reporting on various nuclear energy issues, with a focus on economics and planning. Attended Platts SMR Conference, Washington D.C. May 2013. PopAtomic Studios: Member, Board of Directors, elected December 2012 - December 2014. Secretary of Board, June 2013-June 2014. Professional Reactor Operator Society: Member, February 2013-February 2014. Atomic Power Review: Founder / Author, April 2010. -Will Davis was not a member of any nuclear related industries or ventures for the time period between his honorable discharge from the US Navy in early 1993 until starting Atomic Power Review in April 2010. During that time he became a published author, while pursuing other vocations, and became interested in and eventually seriously involved with the evolving internet. •Portable Typewriter Forum: The world's largest and busiest forum for collectors of typewriters, authors, historians and enthusiasts. Founded October 2002 and owned by Will Davis. •ETCetera: The magazine of the Early Typewriter Collectors' Association. March 2002 - March 2009 had a regular column in this quarterly magazine for historians and scholars concerned with mechanical writing and its continued evolution. Still writes freelance for the publication, as recently as December 2012. US Navy Experience, Naval Nuclear Power Program. 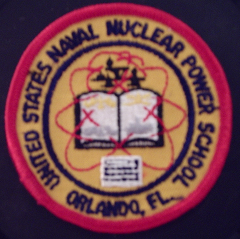 •Attended Naval Nuclear Field "A" School (ET) and Naval Nuclear Power School in Orlando, Florida. Graduated "A" school in top 15%. Also top 15% in Nuclear Power School with GPA of 3.56. •Prototype training: Qualified Reactor Technician, Reactor Operator at S8G Prototype, Kesselring Site, West Milton New York (NNPTU Ballston Spa) 1989. Graduated 4th of 15 students in class. •Assigned to SSBN-641 USS Simon Bolivar (Gold Crew) until 3FEB93. NEC 3353. Qualified Primary Valve Operator, Control Point Watch, Shutdown Electrical Operator, Auxiliary Electrician Aft, AMR2UL Watch, Reactor Operator, Shutdown Reactor Operator. Qualified in Submarines. Also completed cross-qual requirements for Reactor Operator on Electrical Operator and Throttleman watch stations. Collateral duties: 3-M System Coordinator, Repair Parts Petty Officer, Damage Control Petty Officer, Publications Petty Officer, Calibration Petty Officer, Assistant Sound Silencing Petty Officer. Received four Letters of Commendation including one COMSUBLANT. Humanitarian Service Medal for service during Hurricane Hugo, 1989. On lecture schedule on-crew and off-crew for both departmental and divisional lectures focusing on casualty procedures, accident response, BFPL. Good Conduct Medal. Unit Battle "E" won while on board. Made seven full patrol cycles on board SSBN-641. •Reactor Principles Refresher School, SUBTRAFAC Charleston S.C. Graduated 1st of 12 students. Will Davis' Honorable Discharge Evaluation. -Awarded Submarine Atlantic Fleet Letter of Commendation for outstanding performance as reactor operator contributing greatly to the ship's above average grade during an Operational Reactor Safeguards Exam, and for his outstanding performance throughout his tour onboard. -Received Humanitarian Service Award for his relief efforts during Hurricane Hugo and the recovery period; he was responsible for bringing supplies to many needy families. -Demonstrated outstanding technical ability. His efforts were directly responsible for allowing the ship to complete its mission by a timely repair of critical reactor control systems. -Worked diligently during ship's drills and training, directly contributing to an outstanding Nuclear Technical Proficiency Inspection. -Demonstrated his exceptional abilities as both a technician and operator during a rigorous period of pressurizer heater replacement. -Demonstrated exemplary managerial skills as primary and 3-M schedule coordinator for Reactor Control division, scheduling and documenting maintenance. -Displayed impressive level of knowledge by delivering informative departmental lectures. -Demonstrated Naval community concern by actively supporting Navy Relief and local nature conservatories. Petty Officer Davis has demonstrated a high degree of reliability and initiative in all tasks performed. He is a superb Reactor Operator and has passed the wisdom of his experience to junior personnel. He is strongly recommended for advancement. This discharge eval was all 4.0's except for "not observed" for the item 38 management area, which is for E-7 and above only. The 4.0 scores are, in total, in order, for military knowledge / performance, rating knowledge / performance, initiative, reliability, military bearing, personal behavior, human relations (including equal opportunity), speaking ability, writing ability, directing, and counseling. The overall evaluation was 4.0. Fukushima Daiichi reporting, coverage, discussion - How APR and Will Davis figured in. Will Davis and Atomic Power Review were first "picked up" by the press, and by the nuclear industry / establishment at the time of the Fukushima Daiichi nuclear accident in March 2011, although the blog had existed since April 2010. The New York Times contacted Will for graphics, and a number of other brief contacts were made. "We were very fortunate to have Will Davis, a former US Navy nuclear submarine reactor operator as our interview guest here on 'Break for News' a couple of weeks ago when media hysteria was at fever pitch. Will's measured analysis of the true level of risk posed by the Fukushima nuclear incident back then - and since - has proven him (by dint of repeated predictive accuracy on often sparse information) to be one of the most authoritative nuclear risk analysts in the world. ..In stark contrast to many academic and industry nuclear talking heads wheeled out by broadcast and print media in the course of the crisis. Time and again, Will Davis has been on the truth trail while the baying media pack and their "experts" have veered into dead ends." "I relied particularly heavily on the MIT NSE Nuclear Information Hub, created and maintained by the students of the Department of Nuclear Science and Engineering at MIT “not to provide up-to-date information about the ongoing situation at the nuclear facilities in Fukushima, Japan, nor … to promote to a pro-nuclear political agenda … [but rather] to provide non-sensationalized, factual data from engineers in a manner that the general public can understand [and] decipher conflicting news reports and manage the frustrating lack of clarity”. 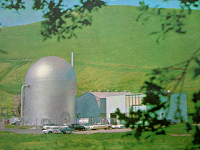 The Atomic Power Review, operated by Will Davis, a former US navy reactor operator, offered similarly in-depth analysis of the emerging data. Both these blogs continue to provide valuable updates even as Fukushima Dai-ichi slides off the front pages in New Zealand and around the world." Will Davis has been a guest numerous times on Rod Adams' ATOMIC PODCAST radio show. 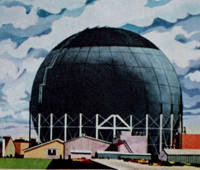 Atomic Power Review's illustrations were requested by, and are being used by, John Froates, Associate Professor and Engineer in Residence at University of Ontario Institute of Technology in lectures and public speeches by direct permission. Professor Froates has 37 years' experience in the field of nuclear engineering. Numerous readers of the blog, both expert and non-expert sent e-mails to Will about the reporting on Atomic Power Review during the time of the Fukushima Daiichi accident and soon thereafter. Here are a few samples. I think your blog has been pretty good - coherent analysis and writing - good straightforward explanation without embellishment - either way. ...Keep up the good work. 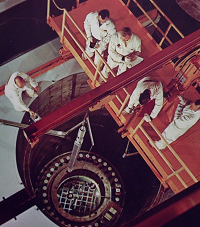 Found your blog through the NEI Nuclear Notes blog. Keep fighting the good fight. Jon Edelson: I wanted to thank you for providing your information and insights into what is happening in Japan. I particularly wanted to thank you for doing a good job of presenting what is really going on, neither overplaying the danger with scare tactics nor downplaying the real hazards. Sam Ricci, materials engineer: I found your site shortly after the Japan events started - I was looking for photos of the containments and the fuel floors. I have made your site and the TEPCO website my first sources of what is happening at the Japan facility. I enjoy reading your hypotheses. I love how you insightfully point to where the answer should be, e.g., are metals in the water, ... why is a hot spot in the turbine building ... which fission products are anticipated ... what is TEPCO really saying. I know that you have a deep respect for the operators and what they need to do to stabilize the plants. You have a great understanding of how the public relations relates to the world regulatory climate. You also know how serious it all is. Keep doing what you are doing, I hear your message. You are doing the right thing. From Will: THANK YOU to all of my dedicated followers - some of whom have been following and reading Atomic Power Review since the Fukushima accident. I appreciate your having selected this blog as something worth reading in what are always busy days and lives and never forget it. Mr. Davis, I recently read your post concerning the Saxton, Pa. training reactor. I have a non technical connection to this facility. My father grew up in nearby Dudley, Pa. He moved to NJ but as a family we would return to that area to summer vacation on the Juniata River. We frequently visited Saxton during the facility's operating years even going to the Saxton movie theater never knowing about the site. Fast forward to 2013 when I motorcycle toured the area. I located the site and visited. Contrary to your description, there are remnants including transmission line structures and an original out building. The containment area is clearly visible, now covered by a concrete pad. Locals fish on the river where the intake had been and I heard a story about a young boy who allegedly drowned swimming near the intake during it's operation. Thought this might be of interest to your readers. I have several photos if you are interested. Tim Henry, Jupiter, Fla.